The first step is to download the ESXi software and copy it to the USB key. You can get this from the VMWare website; the UK portal is at https://www.vmware.com/uk.html. You need a VMWare account in order to download the software, but it’s totally free and only takes a few minutes. Once you have done this you can proceed to download the software – there are a few different options here, but make sure you download the ESXi software which is usually labelled ‘VMWare vSphere Hypervisor (ESXi)’, rather than vCenter, vCenter appliance and so on. The installer files are packaged in a .iso files and the whole image is about 400MB, so is quick to download. Get your USB key – as the source files are so small a 512MB or 1GB key is sufficient. Next, open Terminal, located in the /Applications/Utilities folder. We’ll now have to use the fdisk command to flag the USB key’s partition as bootable, but to do that you’ll have to first unmount the USB key from the system. 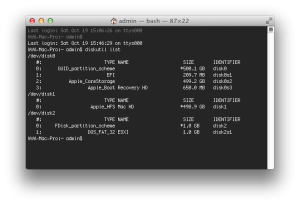 In Terminal type ‘diskutil unmount /dev/disk[NUMBER]’ (as above). If the command works you’ll get a Terminal confirmation that the volume has been unmounted. At the fdisk interactive prompt type ‘f 1’ (without quotes) to flag the first partition on the volume as active and bootable. Follow these commands with ‘write’ and next ‘quit’ to leave fdisk. If at any point you get an error, make sure the volume has been unmounted but not ejected. 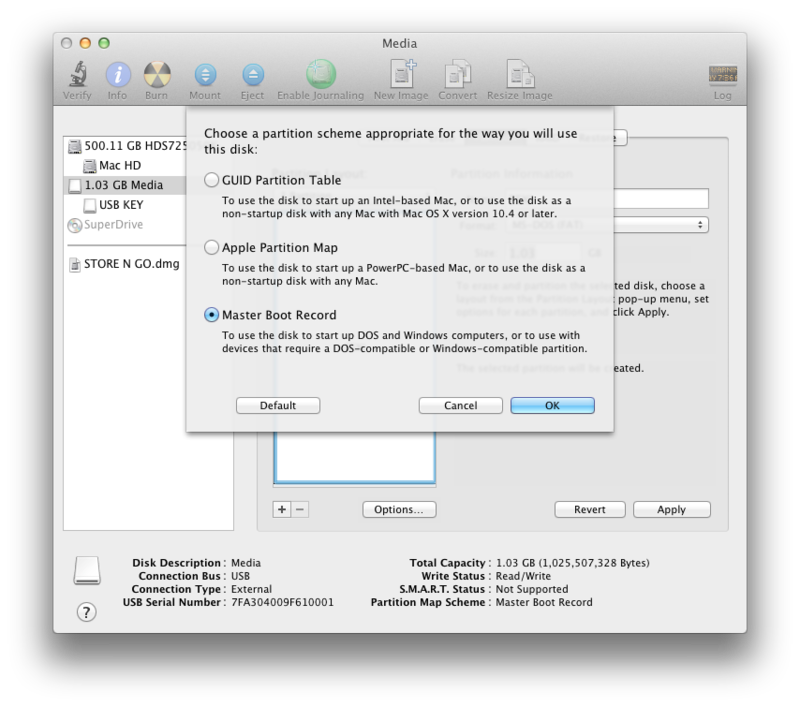 You can always use the unmount button in Disk Utility. After this is complete, remount the USB key onto the Desktop. Close Terminal and mount the ESXI installer .iso. Copy all files from the installer onto the USB Key – you can use Terminal to do this but I simply dragged and dropped through the Finder. The last step is to modify a file on the USB key to tell the system which partition to use when booting up – on the USB key find the file called ‘ISOLINUX.CFG’, rename it ‘SYSLINUX.CFG’ and open it in any Terminal text editor such as vi or pico or open it in TextEdit (but do not open it in MS Word!). In the document, find the line that starts ‘APPEND -c boot.cfg’ and add ‘-p 1’ on the end (without the quotes). Save and Close TextEdit. Now, if all things have been done correctly and successfully you should have a bootable ESXi USB Key! The disk won’t show up as bootable in System Preferences -> Startup Disk but it will work by rebooting the Mac and holding down the Option key (‘alt’ key) to bring up the boot loader. See this article on setting your Mac to boot from the key persistently. 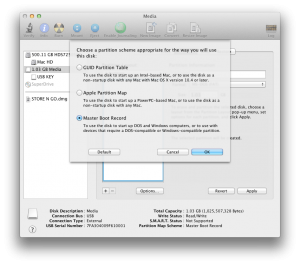 How to install the new(ish) VMware ESXi 5.5 installer files on a USB Key for Mac OS X, the fast and easy way! Worked perfectly for me. Used macOS Sierra 10.12.6 to put Dell edition of ESXi 6.5 on USB stick. Used it to install ESXi on Dell PowerEdge R530. Thanks for posting this. Instructions I found elsewhere did not work. Much appreciated. This worked great on my MacBook 12″. Thank you! You rock! Thanks so much for the detailed instructions. Worked great on my 5,1 Mac Pro with ESXI 6. Thanks for putting this together. I’ve done this on Windows many times but was fumbling around on my Mac until I pulled your post. ISOLINUX.CFG is in 10 different place when I open in TextEdit. How do I determine which one to change to SYSLINUX.CFG? What was the process used to do this? Has anybody tried this with OS X 10.11 (El Capitan)? 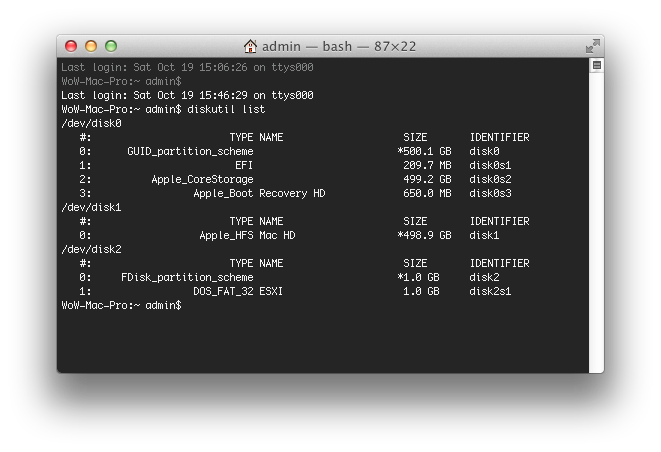 I mark the partition as bootable (f 1) and it puts an * next to it but the * goes away when I “write”. Nice Blog appreciate your efforts to contribute it work as a charm to me. I also have not been able to get this to work, but I suspect that is because I am trying to get the USB drive bootable from a system with UEFI instead of BIOS. Do you know how to make it actually boot on a Mac Pro? It looks like the EFI boot stuff should be there, but I could not even get it to work by burning a CD image of the ISO.